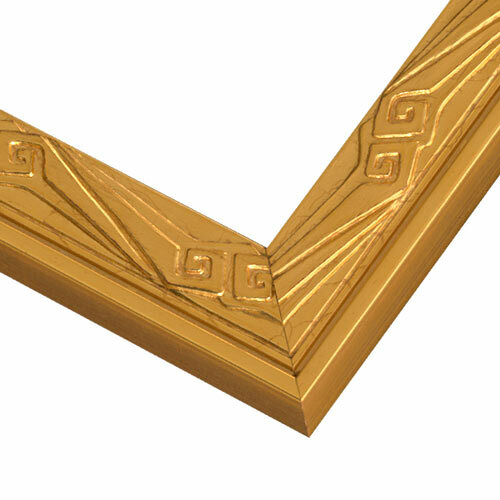 This gold frame, from Artist Jane Seymour’s Nouveau Series, features unique art deco detail – a favorite design style of Jane’s. Your work will stand out from the crowd, as the brilliant raised embellishment creates an incandescence seen nowhere else. Think of this wood picture frame as the crown jewel to your masterpiece – the perfect complement for a world of art and photography. Lovely nouveau or deco frame. Frames of this style are hard to come by at this price. I have it on a painting from the early 1900's and it complements the painting well. Nice quality. Thanks. This frame is super opulent and totally took my antique painting to the next level. It turned out to be a very brassy gold. Also, there was no way to attach the hanging parts. I had to use 3M stickers. Too expensive and it looks cheap. Hello Frances. Thank you for providing your valuable feedback. We understand your concern regarding the color of the frame not being what you expected. We offer free samples which can prevent this issue from reoccurring. We hope you will reach out to us in the future if you are not completely satisfied with you order. We can send you a return label and issue you a refund or get you something else that you will be happy with. We appreciate your feedback. Have a great day.